"JKD is based on the symbol of Yin and Yang, a pair of mutually complementary and interdependent forces that act continuously, without cessation, in this universe. In the above symbol, the Yin and Yang are two interlocking parts of 'one whole,' each containing within its confines the qualities of its complementaries. Etymologically, the characters of Yin and Yang mean darkness and light. The ancient character of Yin, the dark part of the circle, is a drawing of clouds and hill. Yin can represent anything in the universe as: negativeness, passiveness, gentleness, internal, insubstantiality, femaleness, moon, darkness, night, etc. The other complementary half of the circle is Yang, which in its ancient form is written with the lower part of the character signifying slanting sunrays, while the upper part represents the sun. Yang can represent anything as positiveness. activeness, firmness, external, substantiality, maleness, sun, brightness, day, etc. The common mistake of most martial artists is to identify these two forces, Yin and Yang as dualistic (thus the so-called soft styles and the firm styles). Yin/Yang is one separate force of one unceasing interplay of movement. They are conceived of as essentially one, or as two co-existing forces of one indivisible whole. They are neither cause and effect, but should be looked at as sound and echo or light and shadow. If this 'oneness' is viewed as two separate entities, realization of the ultimate reality of JKD won't be achieved. In reality, things are 'whole' and cannot be separated into two parts. When I say the heat makes me perspire, the heat and perspiring are just one process as they are co-existent and the one could not exist but for the other. If a person riding a bicycle wishes to go somewhere, he cannot pump on both pedals at the same time or not pumping them at all. In order to go forward, he has to pump on one pedal and release the other. So the movement or going forward required this 'oneness' of pumping and releasing. Pumping is the result of releasing and vice versa, each being the cause and result of the other Things do have their complementaries, and complementaries co-exist. Instead of mutually exclusive, they are mutually dependent and are a function each of the other. In the Yin/Yang symbol there is a white spot on the black part and a black on the white one. This is to illustrate the balance in life, for nothing can survive long by going to either extremes, be it pure Yin (gentleness) or pure Yang (firmness). Notice that the stiffest tree is most easily cracked. while the bamboo or willow survive by bending with the wind. In JKD, Yang (firmness) should be concealed in Yin (gentleness) and Yin in Yang. Thus a JKD man should be soft yet not yielding, firm, yet not hard." 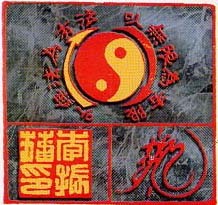 According to Dan Lee, "Bruce added two arrows around the Tai Chi circle to further emphasize that the JKD fighting techniques must contain the harmonious interplay of Yin (pliable, yielding) and Yang (firm, assertiveness) energies." It is to emphasize the continuous, unceasing interplay between the two forces of the universe: Yin and Yang. The Chinese phrases surrounding the symbol are: "Using No Way as Way" and "Having No Limitation as Limitation," pronounced "Yee Mo Faat Way Yao Faat" and "Yee Mo Haan Way Yao Haan" respectively. Regarding the first statement, one is to approach combat without any preconceived notions, and simply respond to "what is." In this way, the martial artist is adaptable and pliable enough to fit in with the opponent and situation instantaneously. He is using no particular or set way that was preconditioned in him. "No-mindedness'' is a term often used to describe this state of unconscious consciousness or conscious unconsciousness. And, indeed, it is an ideal state that is difficult to attain but which one aspires to. In addition, one tries to be like water when using this "no-way" approach. Water automatically assumes the container that it is poured in, thereby constantly fitting in with and adapting to the situation. By having no limitation as the only limitation, one can transcend martial arts boundaries that are set by style, tradition, race, individual preferences, etc. Lee gave the JFJKD man the freedom to explore other martial arts with the only limitation being that he has only has two hands and two feet and the objective is how to use them to the maximum. Furthermore, Lee wanted us to search deep within ourselves to find what works best for each one of us. No longer are we dependent on the teachings of various styles or teachers. But by taking an honest assessment of our own strengths and weaknesses, we can improve our martial skill as well as our daily living. Like he said, "Knowledge... ultimately, means self-knowledge." With this freedom to improve our skill and life in any way that we like, one is able to honestly express one's self. The symbol in the bottom left square is Bruce Lee's personal "chop," which comes from a traditional Chinese seal. Chops have been used in China for more than thirty centuries to stamp documents and works of art with a signature or seal of authority. Comprised of a stone with its impression carved into the bottom, chops were significant in ancient China, since emperors would seal important documents with them. If a document was not sealed with the emperor's chop, the recipient would become suspicious. Reading from right to left and top to bottom, the meaning of the Chinese characters is "Lee Jun Fan Meng." Meng simply means name. Hence, "By the Name of Jun Fan Lee." The character in the bottom right square is Bruce Lee's personal signature in Chinese, an artistic rendition of the Chinese character "dragon," pronounced "loong" in Chinese. Bruce Lee had been nicknamed "the little dragon" since childhood as he had been born in the year of the dragon. According to the Chinese astrological calendar, dragons are passionate, honest, brave, and soft-hearted, but somewhat stubborn, very healthy and energetic. They are intelligent, gifted, and often perfectionists. The use of the three elements explained above is to symbolize that Jun Fan Jeet Kune Do is Bruce Lee's personal art as signified with his personal stamp and signature. Jun Fan Jeet Kune Do is Bruce Lee's personal growth in the martial arts, not anyone else's personal growth. This is the founder's art. The elements are organized such that it be in the form of a chop, and rightly so. It is the official seal of JFJKD, the organization dedicated to the preservation and perpetuation of Bruce Lee's entire body of work. Furthermore, the squarish look of the symbol connotes that this is the foundational building blocks of the art, a structure to be built upon for personal growth. Nevertheless, this foundation is maintained from generation to generation. The order of the chop to the loong signature is to symbolize the transition of the more traditional forms of martial arts to more personal forms of human expression, just as Bruce Lee went from a structured Wing Chun Gung Fu to a less structured Jun Fan Gung Fu to later develop the formless form, Jeet Kune Do. We are to utilize Bruce Lee's life as an inspiration to achieve our full potential in martial arts and life, in general. At the same time, the structure of' JFJKD is maintained with the inspiration planted in each student to work towards personal liberation. It is the objective of the JFJKD Nucleus to promote and perpetuate this inspiration for future generations with the highest degree of accuracy in the contexts of physical/technical training, philosophical thought, and historical background. And this is illustrated by the Jun Fan Jeet Kune Do symbol, a registered trademark of Jun Fan Jeet Kune Do, which cannot be used legitimately by any person unauthorized to do so by the Jun Fan Jeet Kune Do Nucleus. The Jun Fan Jeet Kune Do symbol (logo) is a legally registered trademark and may not be used by any other group or individual without the written permission of the Jun Fan Jeet Kune Do Nucleus.